Adolphe and Lydia Morrill cherished the sweet melodies that floated from their baby grand piano in the music room of their new home. The year was 1919, WWI was over and the future looked bright. Listening to their daughters play the piano helped buoy the Morrill's optimism. After a falling out with his business partner Lorne Wilkie, Adolphe had sold his half of Windsor Machine and Tool. The family had been living in a house on the business property, located just west of downtown Windsor near Riverside Drive. 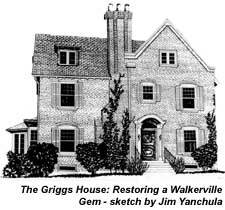 The sale of his business shares provided Adolphe with enough money to buy the stately Stephen A. Griggs home in the prestigious town of Walkerville and start over. "Grandpa was full of ideas" says Rowley. "One time, he decided to breed canaries as a hobby in the attic. He begged and burrowed canaries until he had 300 of them; but one day, the birds flew against the screen window and they all got away. Grandpa had to pay back all the people who had lost their birds. Grandma wasn't too happy- needless to say." He also remembers his mother telling him that his grandfather was able to rekindle his machine tooling business in the garage on the property. "He was doing work for the Heinz Co. back there and even Henry Ford!" marvels Rowley. Life in the Grigg's house was not always melodic for the Morrills. Tragedy struck when daughter Lydia died at age 15 of rheumatic fever; years later, the Morrill's ended up divorcing and the house went back on the market. In 1952, it was purchased by Dr. Walter Percival; the family lived in the house for 45 years. Aware of the historical significance of the home, Dr. Percival succeeded in having the house designated; his efforts are marked by a small plaque attached to the front gate. The present owners, Sharon and Berkley Curtis transferred back to Windsor from Germany in 1997. "The company gave me a week-long house hunting trip," recalls Berkley. "I was visiting friends on Chilver, who said a house on Kildare was for sale. When I went through the place, I knew that this was the house for me." Situated by the gates of Willistead Manor on the corner of Niagara and Kildare, the house was designed in 1905 by the talented American architect, Albert Kahn. The house is named after its first owner, Stephen Griggs, vice-president of the Walkerville Brewery Company. Nine years later he would purchase the brewery from the Walker family. Designed in the Arts & Crafts style, the home has a very English country look. The main floor plyout includes a sunroom, living room, formal dining room, half bath, butler's pantry, kitchen and cloak room. Four bedrooms, the main bathroom plus an ensuite bathroom occupy the second floor and two more bedrooms are located on the third. One of the homes most unique features is the Dutch front door. The three to four inch think door splits so you can open just the bottom of the door or the top, supposedly to keep out squirrels on those hot days before there were screen doors. "When we bought the house, we didn't know how much work it would require. It was intimidating!" Sharon admits. "Every single room in the house needed work. It was something we weren't prepared for but it has been kind of fun too." The Curtis' feel fortunate that the house came with so much property. "It's really rare to find this much space in the middle of this old neighbourhood. The inground pool is very private thanks to the stone fence around it- and the large garden is certainly a bonus," says Sharon. The historical designation meant the Curtis' were prohibited from changing the original architecture on the outside the house. Berkeley said restoring this aspect of the home was quite an effort. "It took two to three months of solid work to restore the garden brick wall. We took it down brick by brick, cleaned each one by hand and then re-layered them. That's been our longest restoration project so far." While restoring the interior of the home, the Curtis' discovered a few surprises, such as solid maple and oak countertops, oak floors and oak ceilings hiding under either Formica, linoleum or paint; the paint on the fireplace was stripped to reveal the original mahogany. An intriguing find was a secret safe in the basement. A room much like a large-sized bank vault was found within the panel walls. It has no handles or doorknobs so the room is never completely shut because the Curtis' fear their children might get trapped inside. Berkeley believes the room was used during the prohibition to store bootleg liquor. The couple is keenly aware of the house's historical significance, considering the many people in the neighbourhood who have lived long enough to know stories attached to the Griggs house. "After we moved in, folks would stop to tell us stories about the house- we began to appreciate that it is a very significant part of Windsor's history," said Sharon. "We want to do everything we can to preserve the history of the house - and to make it comfortable enough to be a family home."